Get ready - it's time for a caption contest! Captions submitted any other way besides in the comment section will not be accepted. That means do not use the feedback form! Captions will be accepted from the moment this post goes live until Wednesday, November 1st at 10 a.m. Mountain Time. So leave your best caption in the comments section below for a chance to win $100 in SparkFun credit. Go! Update: We have a winner! Congratulations Grey Wolf, you've won $100 in SparkFun credit for your caption ("SparkFun: Always look on the beard side of light")! Robert Cowan doesn't sleep, he waits... for New Product Friday. Robert seen at bar using new pickup line: "Baby... you must be a pot of gold because you are at the end of my rainbow". I'm gonna try that on my wife. I can make green too. Alright photo buffs: Lets see you fix the white balance on this one. As an amateur photographer, I approve. "...I want you to be totally honest with me on how the machine makes you feel. This being our first try, I'll use the lowest setting." Neo, choose the blue pill, the story ends and you will wake up in your bed and believe whatever you want to believe. If you take the red one, you stay in Wonderland and I show you how deep the rabbit hole goes. Or take the purple one, or the yellow one, or the green one, or the ecru one, or the "mountain blue" one, or the "forest green" one, or the slightly-pink-but-not-too-pink-one, or the bluish-but-not-too-green-one, or, wait, Neo....where are you going? Sparkfun's commitment to quality has led Robert to verify that the RGB LED strips truly have a 10,000 hour lifespan. No, the LEDs are the same color, the desk is just spinning clockwise very fast. My names Robert.....Robert G.B. or RGB for short. Think of your favorite color and I'll guess it in 3 tries. From this day forward, everyone realized that Rob is color-blind. Real hackers have rainbow tables! I eat A5/1 for breakfast with my rainbow table! I dont always buy LED's, But when I do, I prefer RGB addressable. Introducing: Sparkfun's new Ambilight clone for beards! I really hope they get this reference. Here's my second plan. Back in the 60's, I had a weather changing machine that was, in essence, a sophisticated heat beam which we called a "laser." Using these "lasers," we punch a hole in the protective layer around the Earth, which we scientists call the "Ozone Layer." Slowly but surely, ultraviolet rays would pour in, increasing the risk of skin cancer. That is unless the world pays us a hefty ransom. That... also already has happened. My new masterpiece, I call it ARDUINBOW!! Sparkfun: Always look on the beard side of light. I eat LEDs for breakfast. Welcome to another awesome episode of Schematic Reading Rainbow! "Avatar 2: Screentest of bearded Na'vi "
All your LED are belong to us! Bwa ha ha ha! Bwa ha ha ha! Listen here, Padawan. I'm not sure what you did to my light-saber, but your going to fix it now or I'm taking you to the sith house. "Strip," like this LED strip. What did you think I meant? And why do you have that camera? If you put on the 3D glasses you can see the rabbit. I don't always use this many RGB LED's...but when I do I address them individually. And that, ladies and gentlemen, is how to make your geek shine. Lost in the warehouse full of Sparkfun boxes ready to ship, Robert records his last will and testament. Your feeble skills are no match for the power of the Spark Side. This is what you see when you are late for work at Sparkfun. Not one person has ever been late twice. Welcome to the Rainbow Lair! Here at Spark fun, we don't taste the rainbow, we make the rainbow. So, uh, this is what the LED strips look like lit up. As you can see, it's a really neat product and, uh, you can get all the colors of the rainbow out of it. So check out the product page to order your programmable LED strip today. Some men just like to watch LEDs burn. Somewhere over the LED rainbow, way up in Boulder There's a man that I've seen once in a demo video. Somewhere over the LED rainbow, dreams come true And the inventions that you dare to build, Range from red to green to blue. Robert warms himself by the LED's on a cold winter night. Robert Cowan: The Meaning of Light. So Mr. Bond, you really think you can deduce how many jelly beans there are in the red boxes before the nerve gas is released?? After repeatedly seeing Robert loose power by mid-day, the Sparkfun team replaced his LiPo's, swapped out the charging curcit, and added this oversized charge strength indicator. None of the miniature airplanes would land that day, expressing their concerns over the giant lurking just off the runway. "Do I look amused that you're using this for the caption contest?" Here you see testing on the effectiveness of different colors in the interrogation room. Sparkfun rainbow! What does it mean?? "Girl, you light up my life - much like this one meter fully addressable RGB LED strip. And if, later, you want to put the 'motion in the ocean', I have an accelerometer breakout board that will tell you exactly what you're doing." In an open source environment, there is nothing going on behind the scenes. All the functionality is in the open and available to anyone. It is the human aspect that is... unexplained. A devoted man of science, Mr. Robert is driven to find an electronic breakthrough that can solve some of mankindâs most challenging medical dilemmas. Rebuffed by the powers that be, he decides to make himself the subject of his own experimental treatments, accidentally unleashing his inner demons along with the man the world would come to know as DJ. SparkFunkster-Flex.
" LED talks: Lights worth spreading"
Try as he might, Robert could not make his light saber monochromatic. Supervillain Tip #9 When sending edicts from your hidden lair use mood lighting to instill a greater sense of impending doom in your victims. What can I possibly say about LEDs that I haven't said before? 6 years of broadcasting school, and all they have me doing is this boring new product gig. I get it, you've given me everything from orange to blue. Is it too much to ask to get some "Sparkfun Red"? I'm waaaiting! So now that we've got it lit like this, how long until the pot of gold appears? In this light you can clearly see that left is my good side. I will continue to give you this evil look until you move that camera further left. Disclaimer: Sparkfun's LEDsaber does not include sound effects, batteries and Jedi beard. Robert briefly considers whether he is actually on the set of Portal or Battlestar Galactica. Relax ... focus on the lights ... when you awake you will know everything concerning the use of intelligent lighting to rule the world. First Light-Saber Experiment: Rainbow Unhappiness. Protip: Ghost stories are usually scarier when you illuminate your face with a flashlight, but if you use rainbow LEDs instead, then you'll just end up looking silly. I did it... I made the lights change color... Happy now? Now. Let's discuss that timeshare. Pay no attention to the mind-altering psychadelic lights. Awaiting the first caller on the Blackberry App helpline show. Hmmm, Big Mac or Quarter Pounder? The people impressed with his redshift costume were always walking away. Observe the defensive mechanism of the rare bearded pygmy chameleon specimen. Come to the fabulous side; we have rainbow lightsabres. "Welcome to New Product Friday. Today we will be featuring our new Broadband Keyboard. It's designed for musicians who want to play more than just the Blues..."
It's only weird if it doesn't work? This (and my beard) will make the Red Sox win the World Series. We'll see. Even if it works, it's still weird. Red vs Blue? "SparkFun" your robot costume this year. Don't be too proud of this technological terror you've constructed. The ability to wire this up is insignificant next to the power of the RGB Force. I don't know about yall but I think we are all 7 years to late. "If you ever accidentally drop your keys into a river of molten lava, let 'em go, because man, they're gone." We will be back after this short commercial break to break down the specifications of this rainbow light. ... must not forget to record The Walking Dead.... but this guys occupy brain each fridays... awaiting what is new @ SparkFun..... Jason!? is it you!? n.b. Sorry for my bad english. Robert's least favorite task is cleaning Nyan Cat's litter box. In an effort to increase sales, Robert proposes to the Head of Homeland Security that they increase the number of security alert levels from five to forty. Really, I have to promote ElectriCute on video? Ok, but I'm NOT wearing the fairy dress. Behind the scenes for the 2013 remake of the Wizard of Oz, we have Dorothy about to sing "Somewhere over the Rainbow"
Rob's new product E-Cosmetics needs some work. Realizing he was hypnotized, we could only tell how long heâd been there by the length of his beard. Really....."it seemed like a good idea at the time" is the best you can come up with to explain this? Securely locked in a SparkFun-box-padded cell, his every move monitored on camera, Robert planned his escape. What color does Robert's body prefer? It's having a fight being half red, half blue; half hot, half cold; half fire, half ice; half summer, half winter. What's the best-looking?... No matter the choice, the beard will keep looking like a boss. Or is Robert migrating SparkFun's official color from Red to Blue?.... Please don't do it or I'll cry. A deep sense of foreboding overcame Robert as he contemplated the meaning of light. Welcome to another addition of the Red Green Show! Everyone come see how pink and blue I look! I know it looks stupid, I know it's been two-and-a-half days, and I know you can smell my flesh burning. Lookit: if you want to be a really great "half-black-half-white-guy-from-Star-Trek" for Halloween, you have to be willing to make some sacrifices. In Soviet Chernobyl, Rob glows LEDs! Wait?? What is a Current Limiting Resistor for again? His thoughts can be communicated via the visible light spectrum. He is...the most interesting man in the world. "Is it me you are looking for"
It was only after 43 minutes left alone, holding the same pose that Robert decided the long exposure photoshoot was probably a ruse. Roberts new product Friday post on the day before his vacation: "RGB LED strip, any questions?." Like a rainbows in the darrrrk! Come to the dark side, we make our own rainbows. If you stare at the LED long enough, the LED stares into you. They say that there is not a chin behind that beard just more new products. Good evening everyone and welcome to the night we dive deep into your subconscious and bring out all your inner demons. Don't mind the lights, they will prevent your demons from escaping this room and ravaging the earth. Look Ma! i found a way to wear both of my this year costumes at the same time, looking like William Wallace from braveheart on one side and Darth Maul in the other, and i even have a rainbow light saber. Now im just thinking about how to remove this table out of my costume. Nooooo! He doesn't have an evil thought in his head. Ever!!!!!!!! An ENLIGHTENING table...! (I'm here all week, folks!) Seriously, he was LED to the table by the colorful lights. I'm tired of playing games. Now, I'm gonna give you one chance to come clean here. Have you ever seen this light bar? With extreme concentration, Robert was able to light the strip with his mind. It was considered a breakthrough until management compared his salary to the power bill. Once Robert enters a trance-like state, the mood light indicator is unable to determine his mood. [The methane gas meter just lit up like crazy] Hmmm... what do I tel my loyal viewers now? Hmmm... the methane gas meter display just lit up like crazy ?! Next time on Epic Meal Time we eat LED arrays! Baconstrips! "At the disco no one can hear you scream!" "Chelsea, I know that you didn't want the RGB strip to move around during this demonstration, but gluing my elbows to the table as well was a bit much." Robert, I've a feeling we're not in Kansas anymore. We must be over the rainbow! Grounded by the triangle pose. Don't you dare cross this "Thin Red Line" um orange line, um green, um blue thin line. Blast it, Don't you dare cross my "Rainbow Thin Line"
Just gonna sit here. Sitting here waiting. Waiting for somebody to GET THIS FREAKING RAINBOW OFF OF MY DESK! New Product..... What is next my pal! Your idea is great Gregg, but just an led strip wont transform here to a dj cabin! I m a Pink Blue new product Robert!! Robert ponders how much energy he's saving using LEDs, and from removing October 31 from the calendar. With towers of red boxes surrounding him, Robert stirs in his calamity . . . To choose the Light side or the Dark side. It's not a rainbow.... it's new product friday! We have a whole SPECTRUM of deals for you. What's the deal? It can't possibly take this long to go to the bathroom. I just want to go home. I swear, if he isn't back in like, 2 minutes, I'm outta here. I mean, it got dark in here and everything. Not even a rainbow of LEDs can make this better. Here at sparkfun, the dark side's got nothin. This was Sparkfun's idea for a new 3D technology but something went horribly wrong. As seen here Mr Roberts waits for the New Sparkfun's light therapy to kick in. Good News!!! The wrinkles on his head are not permanent, but the shading might be. Come to the Rainbow Side. We have LEDS. One saber to rule them all, one saber to find them, one saber to defeat Luke and Darth Vader! Go ahead. Tell me about your fancy new RGB LED. You mess with one LED... well I suppose the rest just remain the same. They are addressable. Spectrum? I don't even know them. 'Friday is coming..' Say it like a Stark, otherwise it doesn't work. No, that wavelength will not make your creepy beard go away. Robert Cowan is preparing to win any staring contest this New Product Friday. "There's no earthly way of knowing, Which direction they are going. There's no knowing where they're rowing, or which way the river's flowing. Is it raining, is it snowing? Is a hurricane a-blowing? Not a speck of light is showing So the danger must be growing. Are the fires of Hell a-glowing? Is the grisly Reaper mowing? Yes! The danger must be growing 'Cause the rowers keep on rowing. And they're certainly not showing any sign that they are slowing"
While waiting for the others to gather around for scary Halloween stories, Robert was trying to figure out how they where going to roast the marshmallows over the safe insurance approved indoor camp fire. "This isn't what I meant when I said I needed you to light up my life...."
I believe I have now covered the entire spectrum of this subject. I made it glow. This is Sparkfun! Red or blue? Rob can't decide where he lies on the political spectrum. "The perfect number for marriage is 3." My mom said I could be anything... so I became a rainbow. You have entered a new dimension. A dimension not of imagination, but a dimension of color. You have entered the Friday New Product Post. Like the noble cuttlefish, the engineer uses dazzling displays of color and movement to distract its prey. Playing "red light, green light"... Sparkfun style. Mwah, ha, ha... my digital lightsaber prototype is almost ready! "Welcome, to my evil layer of rainbows and red boxes." No, that should have worked, if italics was what I wanted. I actually escaped those asterisks by putting backslashes before them. Putting asterisks around something is a common (in my experience, anyway) way to express action. All you need to do is come up with a clever saying to win the pot of gold at the end of this LED rainbow. Comw On! I'm Waiting! music video... "rainbow in the dark" DIO ft R.C. It's Friday new Putin post. Your weapons will never penetrate my light force fields! Muhahaha! We don't need no stinking prisms! Welcome to the Matrix, you can take the Red Rob or you can take the Blue Rob. Welcome to the club, the club of darkness and rainbow! Half Hell-boy and half Smurf Rob's true sides shine through. I wonder if I could be a part of Duck Dynasty if I made LED duck callers. This Halloween, Robert decided to give out assorted color "gumdrops" to all the children that came to SparkFun. Let's just say that it didn't go very well. Yes. Androids do dream of electronic sheep. I program them.
" WHAT? Im not flirting with you... Im just using the BLINK sketch... Ok, Im flirting with you..."
Thanks to the overwhelming response to last week's news item describing Stephanie Segall's LED Robot Hallowe'en costume, we invited her back again to show off her latest design: the LED Centipede! I wonder what an RGB tan would look like? Hmm... Beard... Rainbow... Pot of New Products... Robert's a leprechaun! It may be red and cyan, but it's not 3D. Robert Cowan the movie. See it this Friday. Rob met his evil twin after climbing through the RGB portal in his desk to the dark side of Sparkfun. "Taste the rainbow? I built the rainbow. I AM THE RAINBOW!...... let us pray"
Lights, Check. Camera, Check. Where's the action.?.. Maybe I forgot to tell people about the party. Hello, my name is Robert and welcome to Secrets of the Universe. Today we are going to learn how to make plutonium from common household items. "Now that I've set the mood lighting, I'd like you to answer this one question: Who's your favorite Superhero?" In this picture, you see a timid, cave dwelling rainbow geek gnome. He may look cute and furry, he will attack if provoked. Halloween at SparkFun consists of all the lights being turned off and Robert sitting with new products ready to pass out SparkFun products to the trick or treating children. Robert's been watching Men who stare at Goats again. Yes...let the DC flow through you! You should see Gregg's face! "Soon, the entire world will submit to me and my Light - emitting Skittles!" Robert got tired of getting thrown out of the Rainbow Room, so he built his own. Its not a candlelight dinner but if you make the Led's flicker its close enough. Rob moves fast enough to the right to demonstrate the Doppler shift. Hey! There's not enough light in here to read a calendar! Just in time, Mr. Anderson..
Honey, I shrunk the geek. How do I use this on a Halloween themed New Product Friday??? HMMM, this would make a cool light saber to go with my Jedi custom... Bingo!!! "Thank you for joining me. Time to take over the world!" Robert said, "Let there be light!" "I specifically asked for a light saber!!!..." Why do we record this show on Mondays? My name is Robert Cowan, known as Heisenberg, cook of the famous "rainbow" meth. This is my story. The brilliant Robert Cowan is having a little bit too much Spark fun. "Now I have the colors to prove I'm a NeRd"
Wait, wait -- which one is the robot? I assumed this is a round-about way of saying the contest ends in 2017. Your ray gun is no match for my...rainbow forcefield! Yes, the danger must be growing...for the row it keeps on glowing...and it's certainly not showing any signs that it is slowing!!!!!!! Herr Doktor Blinkenlicht vill see you now. We've been watching you, Mr. "Smith"
"My Glo Worm is getting an upgrade"
Which one of you minions is hiding my cat? I can't do the new products video without him. Only after suppressing the battle between his 700nm side and his 400nm side will Bob "Hot and Cold" Roberts be able to see the spectrum of opportunity before him. Ok, you have the evil genius pose and stare down. Now we just need to work on your evil devices. ...no, rainbow LED strips don't count! I want all the colors! 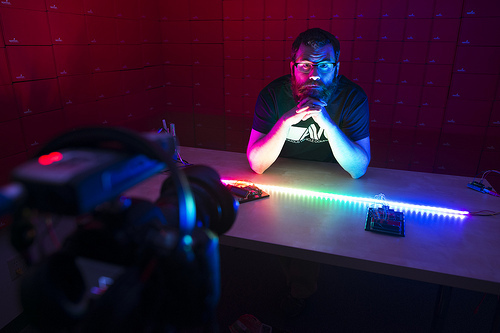 "I don't always sit here and stare at pretty lights, but when I do, I prefer Sparkfun LED RGB strips." I got nothin' man, I mean they look cool, but what can we actually do with them. I may be trying to hide it; but really I'm fascinated by these pretty lights like any other electronic boff. Why does no one else think this is the coolest thing ever!?! Now that he's well lit, we just need him to look into the right camera. No Mr. Bond. I expect you to build a robot! HAHAHAHA!!!! Next week on Epic Meal Time - we're eating Rainbow Laser Bacon. In the year 2000, in the year 2000. "It will take another 13 years, but LEDs will be sold in meter long strips"
Even with a mere 5V of potential, Robert managed to join the Sparkfun Illuminati. Welcome to the Darkside......now in Technicolor. Do we really have to wait until 2017 (the next Nov. 1st that is a Wednesday) to find out the answers? Or is that the magic of the colored timeline? You see before you, our "Rainbow Connection"! And as soon as Kermit shows up, we will begin. The two sides to engineering. "what is E=MC2? and what should I have for lunch?" Crystal balls are sooooo 19th century. Welcome to the future of fortune telling! Luke, I am your Father. This light saber is now yours. body of a text: In conclusion, the research proved that awesome people have beards and like LEDs. caption for the image: Mister Robert Cowan is an example of an awesome person. The name is is TwoFace and looks you landed on the colorful side of the coin! Look, minion, this is a lair. In a volcano. Do I look like someone who wants to "lighten the ambience"? I told you there was a leprechaun at the end of the rainbow! Sooo. what's a led again? Can I tell you something...Rainbow Bright scares the magic blue smoke out of me. True story! Don't worry mom. I've fixed it so you won't have to sit in the dark anymore!
" LED- sticks, LED- sticks, Do you wanna buy LED-sticks? You don't wanna sell me LED-sticks... You wanna go home and rethink your project..."
Look into my eyes... look deep into my eyes... repeat after me... "I want more LEDs." I need more LEDs." Can't decide what color to be. Ok Luke you've pondered the thing long enough now pick it up already. Sulking in the the Sparkfun Furlough room!